Sweet and tangy dessert that I made a month ago for our ladies' gathering... Good feedback & they were amazed how sweet it was. I learn to make this from my mother and it is my hubby's favourite. He was so excited when I made it because I haven't made it for quite sometime. The last time I made it was a year ago. The recipe was shared here before but pasted here again. 1. Wash and soak glutinous rice for 4-5 hours. Steam until soft. Cool completely. 3. 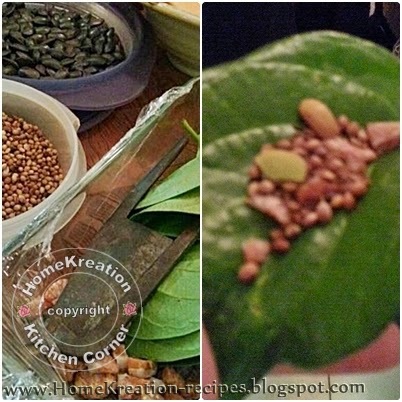 Shape into small balls & place in a container or wrap individually in banana leaves. 4. Wrap with thick cloth & keep in a dark place for 3-4 days. 5. Serve with vanilla ice-cream or by itself. Tapai Pulut emak Along tiada tandingan nya.... manis amat dan terasa gas yg menggigit2 lidah... Along rasa tapai yg Along buat pun hampir2 bagus macam yg Emak buat....hehe. Bila kawan2 Along makan semua tanya napa manis sangat sampai ke tekak, banyak gula ke... Gula dalam resipi tak banyak, cukup utk mengaktifkan ragi sahaja tapi bergantung pada mutu ragi yg di gunakan dan penapaian yg baik akan menghasilkan tapai pulut yg manis. Ini kerana kandungan karbohidrat semulajadi dlm pulut yg bertindak-balas dengan ragi akan menghasilkan gula semulajadi. Resipi Along dah kongsi di sini dulu tapi Along kasi terjemahan BM kali ni. 1. Basuh & rendam beras pulut 4-5 jam. Sejukkan sehingga betul2 sejuk (ini penting spy ragi tidak rosak). 2. Gaulkan pulut dgn ragi dan gula sehingga rata. Percikkan air supaya pulut tidak berketul. 3. Bulat2kan & bungkus dgn daun pisang yg di layur atau simpan terus dlm bekas besar. 4. Bungkus bekas dgn kain tebal & simpan dlm bilik yg gelap selama 3-4 hari. 5. Hidangkan dgn aiskrim vanilla atau begitu sahaja. Pressed Rice cubes are Malay's special treat during festives and typically served along peanut sauce, satays, Lodeh, Soto, etcs. You can also fry it like noodles and very delicious too! My version put some peanut sauce in it and it is fabulous! 1. Heat up few tbsp oil & stir fry garlic & onion until fragrant. Add in chili powder & stir quickly above slow fire. Break in eggs & stir until scrambled. Add in peanut sauce, salt, vegetable and stir well. Add in rice cubes, soy sauce and stir until evenly mixed. Kalau dah jemu makan Nasi Himpit cicah kuah kacang, meh kita goreng camni pulak.... simple and sedap, boleh makan cepat2... banyak2....hahaha.... Yang best nya Along letak kuah kacang dlm masakan tu.... wooo kaw tau... cuba lah ya! 1. Panaskan sedikit minyak & tumis bwg besar & bwg putih sehingga layu & wangi. Masukkan serbuk cili & kacau cepat2 dgn api perlahan. Pecahkan telur & kacau supaya telur hancur. Masukkan kuah kacang, garam, sayur & kacau sebati. A couple of weeks ago we had gathering at my house to bid farewell to a friend who was leaving for New Zealand and yesterday I invited Sarah & Britton for afternoon tea before they return to San Francisco. Two farewells in a month is quite drastic experience.... saying good bye is always sad but I hope the friendship will continue... They both are such lovely friends and am going to miss them although we only know each other for a short period. 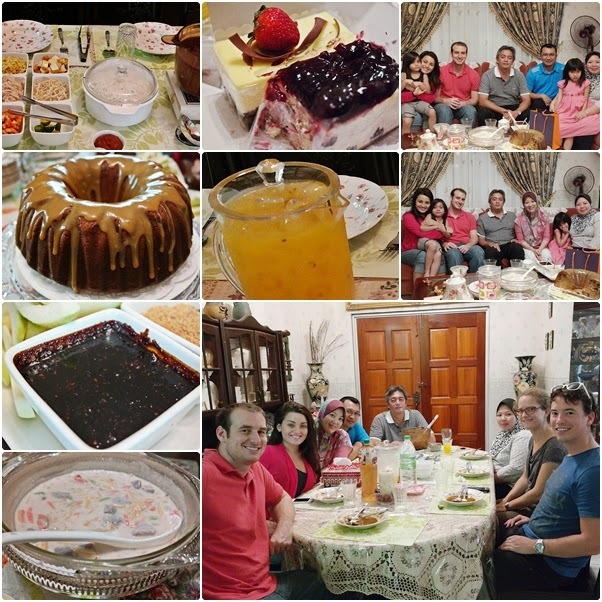 We also invited few other friends whose spouses never been to my house yet, nice getting to know Fabian & Aisyah. It was just a short evening tea and hope we'll meet again some other time. I love having friends over at home environment because you will feel closer and better bonding. Sarah volunteered to cook Laksa Sarawak which is her favourite Malaysian food. I taught her traditional way of preparing it and she learn how to pound onion in Lesung Batu (stone mortar) and making Sambal Belacan. I'll buy her a lesung for a gift... something to remind her our fun experience cooking in Malaysian kitchen. Liana was very shy but at the end get warmed up with Sarah and they both cuddles and enjoyed playing together... except it was still hard for Liana in speaking up... hopefully she will overcome her fear to speak up to people one day and could confidently be her real self... she speaks a lot at home & love singing. I always lay tables ahead of time so that I get myself more organised... Not having a maid, everything need to be well planned to ensure I have time to sit down & entertain the guests when they arrived. Thank-you to my sporting hubby who gave me strong hands! 1. 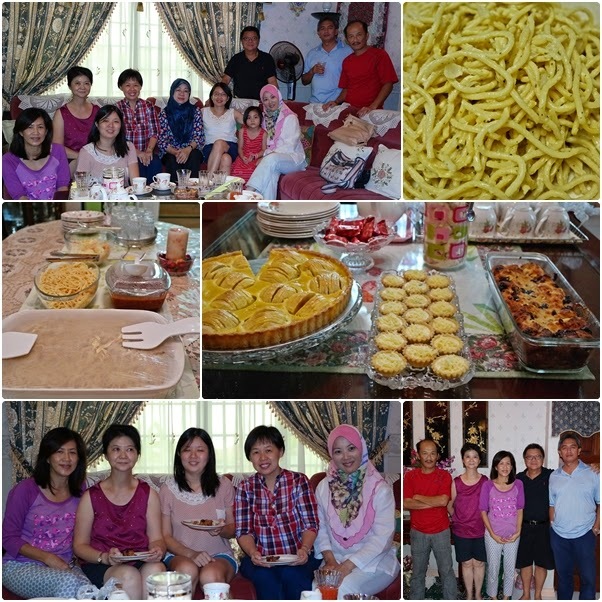 The main menu was Laksa Sarawak, jointly cooked and prepared with Sarah & Britton... a real teamwork! Britton did very nice job in shredding the chicken meat with hands. We managed to clear the whole pot and no leftover at all.... great! See Hairul's cheek... he was really enjoying the homemade Rojak sauce! I'm glad that they all like it! Thank-you Hairul for helping me in the kitchen too. 3. White Banana Butter Cake with Chocolate Chips, served with Butterscotch Sauce... my favourite cake and glad that they like it too. Sarah loves this so much so I pack some to tapao. I love the sweet smell and malt taste of this cake... It is a simpler version of the traditional Sarawak Moss Cake as it requires only 1 hour as opposed to typical 4 hours steaming. It has also been modernised with cream topping. Personally this is my favourite cake! It is suitable for special occassion which I made for our women gathering several weeks ago. 1. Beat margarine & sugar until fluffy. 2. Add in egg one by one while beating. 3. Add in rest of ingredients in the above order while mixing well each addition. 4. Pour into greased caserole. 5. Steam 1 hour above medium heat. 6. Spread non-dary whipping cream after cake is cool and sprinkle with a slice of crumble cake. Kek Lumut memang popular kat Sarawak.... tapi nak kukus sampai 4 jam yg kekadang tu terbantut... tapi jangan gusar, sebab resipi ni cuma kukus sejam sahaja. Hasil nya tetap sedap & tidak menghampakan. Rasa Kek lumut biasalah mesti harum bau pandan & lemak horlick, sekaya dan sebagai nya... memang best tapi kali ni kita ummmph kan lagi dengan topping krim.... walaaaaa sedap tak terkata... heheee sendiri bikin sendiri cakap lah! Along tercari2 resipi ni dan terjumpa di rumah Atie. Terima-kasih ya Atie berkongsi, memang marvelous! TQ juga pada pemilik asal resipi ni, semuga Allah murahkan rezeki semua nya. 1. Pukul majerin & gula sehingga kembang & gebu. 2. Masukkan telor sebiji demi sebiji dan pukul lagi hingga kembang. 3. Masukkan bahan2 seterus nya seperti urutan di atas sambil di gaul sebati. 4. Masukkan adunan ke dalam bekas kaserol tahan panas. 5. Kukus selama 1 jam dgn api sederhana. 6. Setelah sejuk, sapukan dgn non-dairy whipping cream & tabur dgn sehiris kek yg di hancurkan. Typically peanut sauce is for satay dip &/or pressed rice. We all in the house just like it plain with pressed rice although sometimes I like to add chicken bits in the sauce. I always make the way I made... you can check here and here. Somehow, I was curious to try something else since I saw good comments in friends' blogs. It turned out to be too sweet to my taste similar to those that typically sold out there. I will halve the amount of sugar if I were to make it again but it all up to individuals as some will like it. 1. Combine palm sugar, tamarind juice & peanuts. 2. Heat up oil and stir-fry blended ingredients until fragrant. Add in sugar, salt, turmeric powder and stir well. Add in tamarind juice & peanuts. Stir and cook for a while until oil surfaced to the top. 3. Served with pressed rice &/or satay. Kali ni saja2 nak cuba resipi kawan2 pula sebab Mas kata sedap resipi ni. Selalu nya Along buat ikut resipi sendiri macam kat sini & sini dan letak ayam sedikit. Bila tengok sukatan gula tu Along dah tau memang manis Kuah kacang ni tapi Along ikut jer sukatan tu nak tau camna rasa nya. Memang manis sangat rasa nya dan bagi anda yang memang suka kuah manis macam yang selalu di jual dengan satay tu oklah ya, terpulang citarasa masing2. Along cadangkan anda separuhkan sukatan gula nya & tambah sedikit2 jika perlu supaya tidak terlajak manis nya. 1. Satukan gula merah, asam jawa & kacang tanah kisar. 2. Panaskan minyak dan tumis bahan kisar hingga garing. Masukkan gula, garam dan kunyit serbuk dan gaul rata. Masukkan bancuhan air asam dan kacang ke dalam bahan tumis. 3. Hidangkan dgn satay &/atau Nasi Himpit. If you are cheese lovers, go for this double cheese tartlets... The crsipy tartlet filled with cream cheese that matched with lightly sweetened organic strawberry jam and finally topped with salty shredded cheddar cheese... rich but balanced taste! The tiny size of it make you forget about the calories...LOL! 1. Beat cream cheese with sugar until soft & smooth. Add in egg, VE & beat until well mixed. 2. Spoon 1/4 tsp jam into the pre-baked tartlet pastry. Pipe cream cheese filling on top. 3. Bake at 170C for 10 minutes until the surface is firmed to touch. 5. Let it cool and top with shredded cheddar cheese. 1. Pukul cream cheese & gula sehingga lembut. Masukkan telur, EV & pukul sehingga sebati. 2. Sudukan sedikit jem strawberry ke dalam tartlet pastry. Paipkan adunan cream cheese di atas nya. 3. Bakar pada suhu 170C selama 10 minit sehingga permukaan nya kering & tidak melekat apabila di sentuh. 5. Sejukkan & tabur parutan keju cheddar. Sejukkan dlm petisejuk sebelum di hidangkan. A colleague is retiring and leaving Malaysia next week to live in New Zealand. I've known her since I started working in the company for more than 20 years and she is such a wonderful colleague and friend. 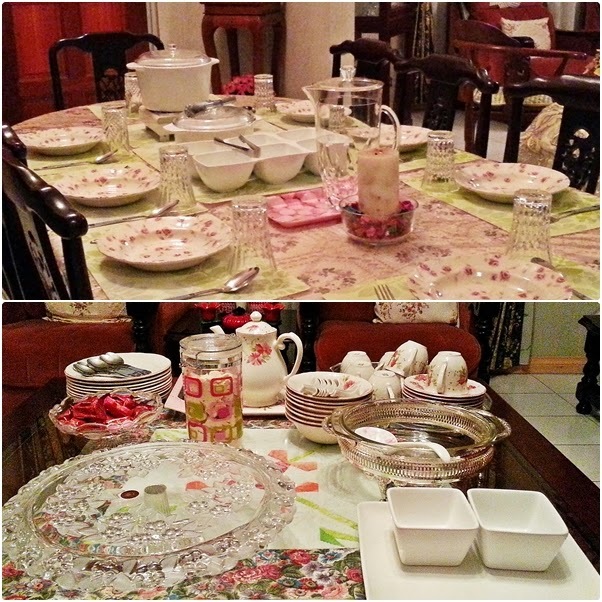 Surely I'm going to miss her and invited her and few other friends for a simple evening tea. Wish her the best retirement and takegood care of yourself. This recipe produces nice aroma fried chicken with crispy & spicy coating.... love every bite of it! The way I did mine is frying it in shallow oil so that the spices will coat the chicken nicely and none wasted. Furthermore, this method the chicken meat will be juicy & not too dry. Since I did not use a lot of oil, it is important to use non-stick wok to prevent sticking and burning the spices before the chicken is cooked. 1. Marinate chicken with all the ingredients. 2. Heat up 1 cup of oil in a non-stick wok. Pour in chicken together with all the marinated ingredients. Fry until chicken pieces are cooked and coating ingredients are crispy, flipping the chicken pieces occasionally. 3. Serve with rice or on its own. Meh tengok camna Along buat Ayam Goreng berempah.... bahan2 nya biasa je tapi letak 1 sb tepung beras akan menghasilkan salutan yang rangup dan melekat pada ayam. Along goreng dgn minyak yg tidak terlalu dalam supaya salutan semua nya melekat pada ayam tapi kena guna kuali yang tak melekat supaya tidak mudah hangus. Cara ni juga akan menghasilkan gorengan ayam yang rangup di luar tapi juicy & tidak kering isi nya. 1. Perap ayam dgn kesemua bahan2. 2. Panaskan 1 cwn minyak di dalam kuali yg tidak melekat. 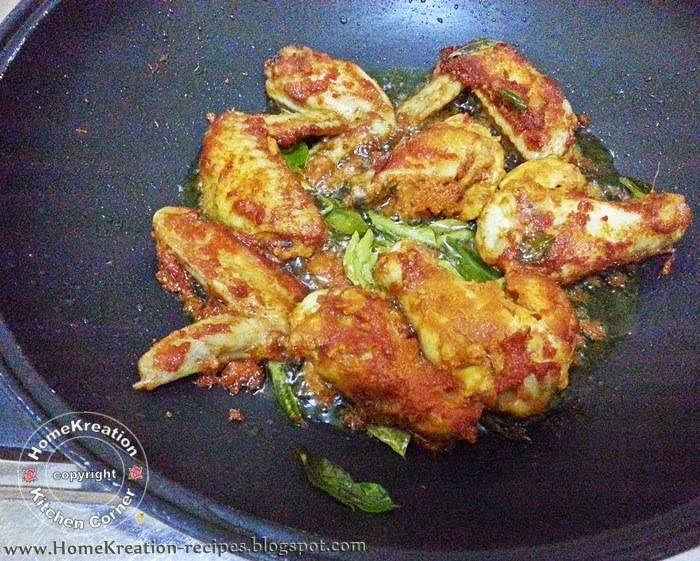 Masukkan ayam berserta bumbu2 nya & goreng sehingga masak & garing. 3. Hidangkan dengan nasi atau untuk ratahan. A simple and healthy kampung dish.... in my PIL's house, this is being cooked for almost everyday as long as there are fresh fish supply from the sea outside the monsoon season... The fish is so fresh and 'sweet' straight from the daily captive into the pot... You will never get fed up but instead will be at risk of doubling your plate! Yesterday we received a box of fresh fish sent through a bus nicely packed in a cooler box from my hubby's parents.... such a loving thought.... The village people called this Sea Chicken (literally translated from the local language). It has soft & melt-in-the-mouth flesh! Alhamdulillah, hajat hati nak makan lauk ala kampung, Asam Pedas Rebus yang sedap tercapai akhir nya.... Nak masak lauk ni, syarat nya mesti jenis ikan tertentu sahaja dan yang penting sekali ikan tu mesti yang segar. Dalam dok berangan2, tetiba sampai sekotak ikan kiriman mertua... ikan nya amat segar dan masih berlendir baru di tangkap pagi tu. Apa lagi, Along pun terus masak lauk idaman ni.....aduhhh Along makan nasi malam semalam bertambah2... selera sungguh. 1. Cuci ikan bersih2 dan bilas dgn asam jawa atau jus limau. 2. 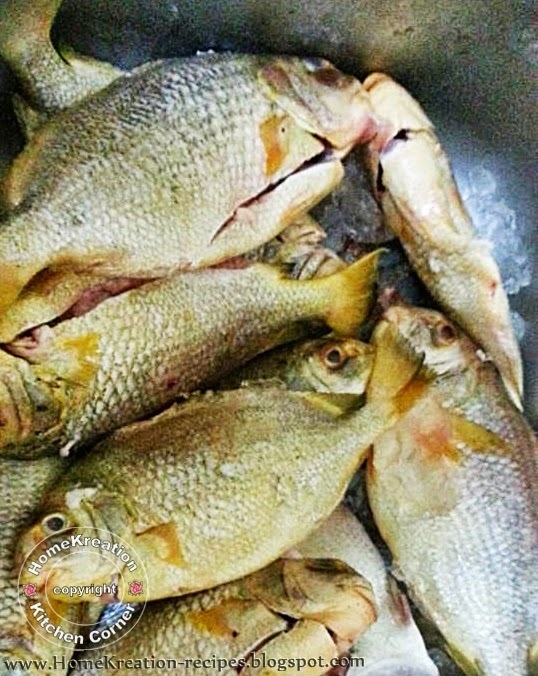 Masukkan kesemua bahan2 ke dalam periuk dan masak sehingga mendidih dan ikan masak empuk. Imbangkan rasa garam & asam. 3. Hidangkan dgn nasi & ulam2an. I made this many times again and again... soft & rich with apple chunks and you will never get enough! I actually made this for a colleague who helped me to organise my Hari Raya treat in the office since she mentioned that she likes this cake so much. I made them into mini size bundt cake, perfect for gift packs. Left some for hubby & Liana who love it too! Kek Epal yang tersagat sedap... dah banyak kali Along buat kek ni tanpa jemu. Kali ni Along buat dalam bekas kecil, dapat 6 biji mini bundt, senang nak hadiahkan kepada kawan. Kek ni sedap sangat sebab ketulan epal yang banyak harum wangi dan manis sederhana. Resipi boleh rujuk di sini. This Nyonya style curry is slightly different than the typical Malay curry with some herbal tweak making it more fragrant. I like my curry with thin gravy and we just love this version. Another version of lovely Curry Kapitan I made earlier was shared here - also very good. Had double plate.... especially good with Malay Ulam & Sambal Belacan! 1. Heat up a scoop of oil & stir-fry blended ingredients & lemongrass until fragrant. Add in chicken & potato, stir well & cook few more minutes. Add in coconut milk & cook until boiled and potatoes are tender. Add in Kaffir Lime leaves, lime juice and salt. 2. Cook few more minutes and serve with white rice. 1. Panaskan sesenduk minyak & tumis bahan2 yg di blend* & serai sehingga wangi. Masukkan ayam & kentang, gaul rata dan masak beberapa minit lagi. Masukkan santan & masak sehingga mendidih & kentang empuk. Masukkan daun & jus limau dan garam. 2. Masak beberapa minit lagi & hidangkan dgn nasi putih. I made this yesterday to bring to a friend's birthday party. I started to bake it an hour before the party started because I came back from town late that afternoon. So I brought it to his house fresh from the oven and poured the topping during serving. It was a hot hit with many compliments including from the teenagers who were there... quite surprise that everyone like it! Actually the cake will mature and taste better after two days but it was good when served warm too. The sweetness is moderate with dense and soft texture. The dates blended very well with the cake and it tasted almost like pudding and delicious combination with butterscotch sauce. 1. Place dates and bic soda in bowl. Pour over boiling water & allow to stand, uncovered, for 20 minutes or until dates are tender. 2. Beat butter, sugar and vanilla until pale and creamy. Using a large metal spoon, stir in date mixture and flour alternately. Mix until well combined. 3. Bake at 180C for 40-45 minutes. Stand for 10 minutes before turning onto a wire rack. 4. Make butterscotch sauce: Combine butter & sugar in a saucepan over medium heat and stir until bubbling. Add in fresh milk slowly & stir until dissolved & boiling. Add in EV & condensed milk & stir 1-2 minutes until slightly thickened. Pour warm sauce over warm cake. 1. Gaulkan kurma & bic soda dlm mangkuk. Tuangkan air panas & biarkan selama 20 minit sehingga kurma lembut. 2. Pukul butter, gula & EV sehingga putih. Guna senduk kayu, gaul kurma & tepung berselang-seli sehingga sebati. 3. Bakar 180C selama 40-45 minit. Biarkan 10 minit sebelum kek di keluarkan dari acuan. 4. Untuk sos butterscotch: Masak butter & gula dlm periuk dgn api sederhana sehingga berbuih. Masukkan susu cair sedikit2 sehingga gula larut & mendidih. Masukkan EV & susu pekat, kacau 1-2 minit sehingga agak pekat. Tuangkan sos yg suam ke atas kek yg suam & hidangkan. Yesterday was really one fun day.... seronok gather dengan kawan2 facebook dan kawan2 karib.... Ada yang dah lama tak jumpa, lepas rindu berjumpa walaupun hanya sepetang rasa nya tak puas berbual. 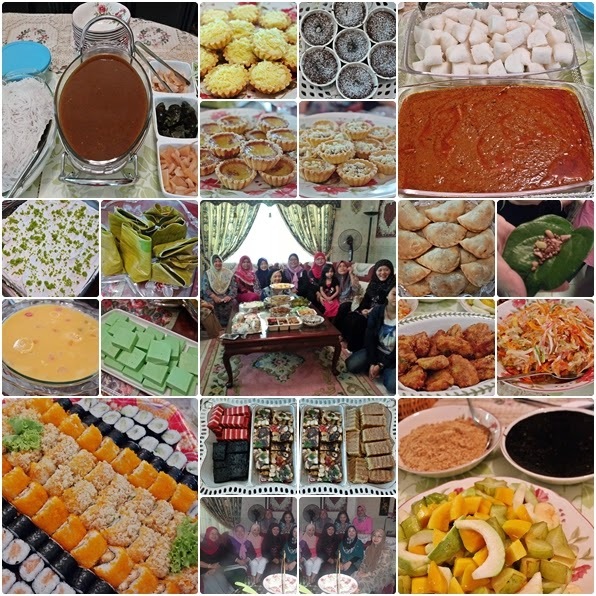 CikTie & sisHani tolong organise and ramai gak yang pot luck.... Terima-kasih semua nya yang hadir... susah2 jer bawa buah tangan walau pun Along dah kata tak payah tapi bawa juga.... banyak nya makanan kalah Hi Tea kat hotel....heheee.... alhamdulillah, murah rezeki. Kalau terkurang layan, jangan ada yg kecik hati pula ya... al-maklum takda maid, semua kena buat sorang2... sambil layan tetamu lari sana sini nak sediakan apa yg patut... Memang sonok sangat dapat gather & miss few friends yang tak dapat hadir.